Smile JV - Genuine Exporter and Auction Agents for Used Cars from Japan. Japanese Used Cars, Used Mercedes Benz from Japan, Used BMW from Japan and European Cars from Japan. 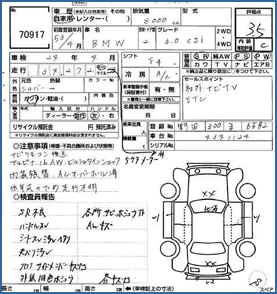 Buy from Japanese Auto Auctions. Auction sheets can be confusing to read and understand, but we are here to help you through the process. This section explains the basics of how the auction sheets are set out and what to look for when deciding on a used car to buy. Auction sheet layouts do vary depending on the auction house. This auction sheet, provided by USS, explains what all those boxes mean. Study it for a while (click to enlarge) and become familiar with all the detail. 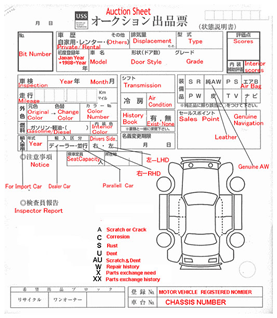 Notice the key near the car diagram - this is a simplified version and a full list is given below. A - Scratch or Crack; A1 scratch 2-3 cm, A2 < 10 cm, A3 > 10 cm. C - Corrosion (bad rust). U - Dent; U1 Dimple, U2 < 10 cm, U3 >10 cm. B is sometimes used instead of U. AU - Scratch and Dent; again can be combined with numbers. W1 - Repainted as good as new condition. W2 - Repaired & repainted in good condition. W3 - Repaired but the surface finish is bad. Y - Crack; Y1 crack 2-5 cm, Y2 <10 cm, Y3 >10cm. X - Part exchange required. The following tables outline the basic condition of the used car and options it may include. The first table relates to the exterior condition, the second the interior, the third to options. It's important to note that these are general guides and the specific auction sheets contain substantially more information regarding condition as we will see further down the page. S The vehicle is less than 12 months old from the first registration date and travelled less than 10,000 km. The vehicle is in immaculate as new condition. 6 The vehicle is less than 36 months old from the first registration date and travelled less than 30,000 km. 5 The vehicle has travelled less than 50,000 km. The exterior may have some minor scratches and marks. 4.5 The vehicle has travelled less than 100,000 km. The exterior generally has more minor scratches and marks than grade 5. 4 The vehicle has travelled less than 150,000 km. The exterior has some scratches/scrapes and possibly minor dents. 3.5 The exterior has some noticeable scratches/scrapes and/or dents, may contain rust or corrosion. This grade will require some repairs. 3 The exterior has more noticeable large scratches/scrapes, paint blemishes, and/or large dents. This grade will generally require more repairs than a 3.5 grade. 2 Very poor condition, save up for something better. RA Minor accident vehicle to which the damage has been repaired. R More substantial accident vehicle to which the damage has been repaired. *** Accident car or "As it is condition"; Engine may no longer work. A The vehicle interior is as new. B The vehicle interior is in excellent condition, may contain minor wear marks, may require light cleaning. C The vehicle interior is in average condition and may contain cigarette burns, torn upholstery, screw holes, cracked dash, glue. Interior will require cleaning. D The vehicle interior is in poor condition, worse than 3 and will require repair and heavy cleaning. Interior may smell. E The vehicle interior is in very poor condition and will require extensive repair. Interior may smell. As can be seen from this real world example, auction sheets can get very complex. But don't worry, we are here to translate every detail to ensure you buy the exact car you want, in the exact condition of your choice - it's all part of the service we provide.